A disruptor to Precision Medicine and Nutrition through biomarker discovery InSyBio is a privately held Company focusing, through advanced big-data computational tools, on biomarker discovery for Cancer, Neurodegenerative diseases and Nutrition. 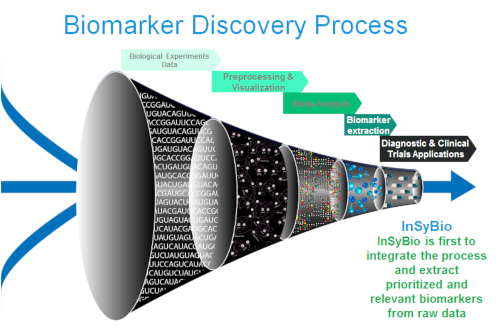 Biomarker extraction from biological big data (genomics, transcriptomics, proteomics, etc.) is essential for drug discovery & research acceleration, personalized medicine and personalized Nutrition. Modern approaches in diagnosis, prognosis, disease progression and treatment require biomarkers from biological big data; these can only be discovered however through the utilization of bioinformatics methods and efficient big data analytics tools. Existing tools and approaches are single-task oriented, costly, and they treat different types of biomarkers (genes, RNA, proteins, clinical biomarkers etc.) using individual and not interconnected processes; thus, resulting in limited scientific deduction. Moreover, existing approaches which are mostly rely on statistical analysis, require a high number of samples for the identification of biomarkers which makes them in-applicable to early stages and Phase 1 clinical trials. InSyBio Suite patent-pending breakthrough solution is integrated into a S/W platform (InSyBio's) and is able to significantly speed up the biomarker discovery process by providing an end-to-end analysis process by requiring limited number of samples for the biomarker discovery phase and ending up discovering fewer biomarkers, simplifying thus the validation process. Moreover, with InSyBio's solution, the identified biomarkers and predictive models are becoming far more accurate due to the effective combination of a minimal set of biomarkers with Artificial Intelligence models instead of using these markers unassociated. These advantages are enabled by InSyBio's proprietary technology which offers simultaneous integration of data from different sources and types and has demonstrated ability to locate significantly more common proteins in large scale proteomics datasets. InSyBio's solutions are based on biological networks modeling to integrate many layers of complex biological information (mutations, proteins, clinical variables, peptides etc.) and advanced big data-oriented artificial intelligence methods. InSyBio has already completed and published several research works on biomarker discovery for several cancer types, nutritional products, radiation therapies, Parkinson’s, alzheimer, stroke and other diseases emphasizing on proteins and non-coding RNA molecules through its collaborations with the universities, biotechnology companies and research institutes. Finally, InSyBio has been awarded so far with several distinctions in worldwide competitios with each solution being pinpointed as one of the most promising solutions to speed up and facilitate clinical and preclinical research.